Idelle, this is a joyous moment for you and for us who are members of Annunciation Monastery. We are happy to share in this celebration with your family and friends. All of us pray with you that the Holy Spirit may sustain you in your search for God. Thank you to all who nurtured, supported and encouraged Idelle in her desire to deepen her relationship with God and with the Benedictine community of Annunciation Monastery. We just heard readings from two foundational sources for us Benedictines – Sacred Scripture and the Rule of St. Benedict. We know from several references in the Rule of Benedict that Scripture was so imbedded in Benedict’s heart and mind; so much that it overflows in the Rule he wrote. “I have come not to do my own will, but the will of the one who sent me.” In the Gospel of John, Jesus speaks of doing God’s will, not his own will. Jesus does this in order for his disciples to believe in the one who sent him; so that all who believe may have eternal life! Jesus gave of himself completely. In his rule, Benedict uses this same scripture passage as he teaches us about the twelve steps of humility; namely the second step which instructs us to love not our own will, but rather imitate that same saying of Christ we find in the Gospel of John. It is helpful to know that Benedict’s concept of humility directs us to begin the spiritual life by knowing our place in the universe, our connectedness, our dependence on God. So in order to find meaning in the second step of humility, one must look at the first step which is keeping the reverence of God always before our eyes and to never forget it. It is to recognize that God is God and that we must continually reach out for God. In Joan Chittister’s commentary on the Rule of Benedict Insights for the Ages she writes, “If God is my center and my end, then I must accept the will of God, knowing that in it lies the fullness of life for me, however obscure.” An obvious question is how do we recognize the will of God? How do we tell the will of God from our own? We go back to the fact that Jesus who said, “I have come not to do my own will but the will of the one who sent me” is also the same Jesus who prayed in Gethsemane, “Let this chalice pass from me.” The will of God for us is what remains of a situation after we try everything and pray without ceasing to change it. The monastic life strives for this surrender to God’s will. As a result we can grow in a loving relationship with Jesus and with others. We seek God as we live in community and we pray that we will know what God’s will is for us. Through your first monastic profession, Idelle, you are able to approach this moment with a great deal of confidence and, as a member of this community which Benedict calls the school of the Lord’s service, you will discern the wisdom of Benedict: to seek God, who first seeks us. Idelle, you will continually come to know the will of God as you faithfully live out the threefold promise of stability, fidelity to the monastic way of life and obedience. You have studied what this means, but I can assure you that the meaning of this commitment will grow deeper every day you live the Benedictine life. 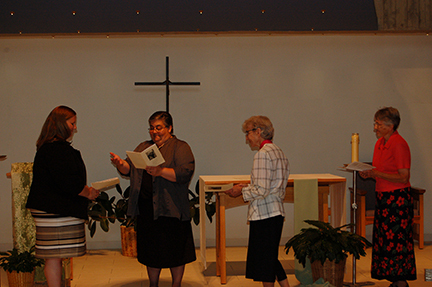 Through stability, we Benedictines commit ourselves to this group of women in this community. We are here through the thick and thin of life. By the promise of fidelity to the monastic way of life we commit ourselves to a continual transformation made possible through God’s grace. We live this life of prayer, community, hospitality and service with our whole being. And it is through obedience that we are able to listen to what God speaks to us. We listen with the ear of our heart to the prioress, one another in community and all others we encounter. Through prayer and scripture God reveals his will to us. And we are able to respond because we believe and trust in God’s love for us and we have one another to support us in our journey. Idelle, we are grateful for your generous spirit and your response to God’s call. We promise you our prayer and support. Together we seek God and we do encounter God in ordinary events and relationships of daily monastic living. May God’s peace, which is beyond all understanding, dwell deep within you and all of us. May we prefer nothing whatever to Christ, and may he bring us all together to everlasting life.